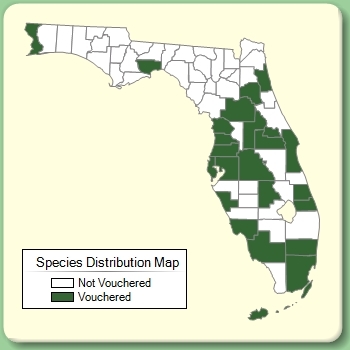 Plant Notes: Verloove (2014) treated this taxon as a subspecies as C. alternifolius subsp. flabelliformis. 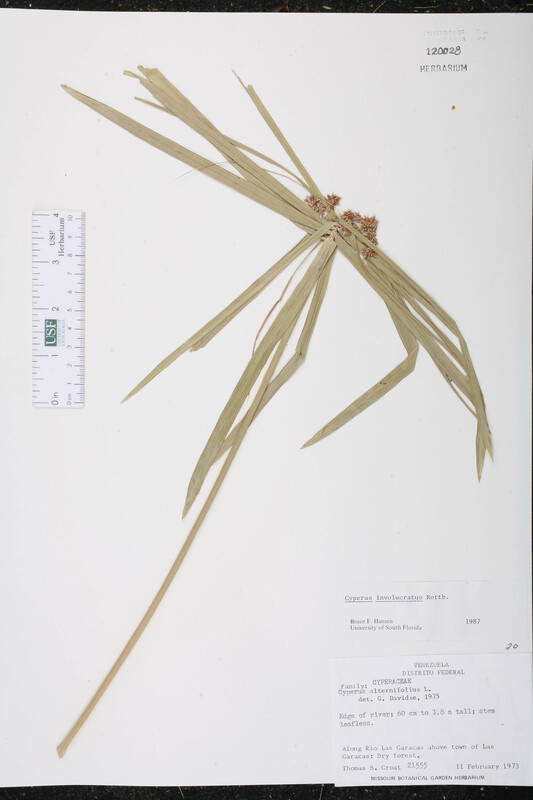 Citation CYPERUS INVOLUCRATUS Rottbøll, Descr. Pl. Rar. 22. 1772. Type: "Arabia", without data, Forsskål s.n. (lectotype: C). Lectotypified by Baijnath, Kew Bull. 30: 522. 1975. 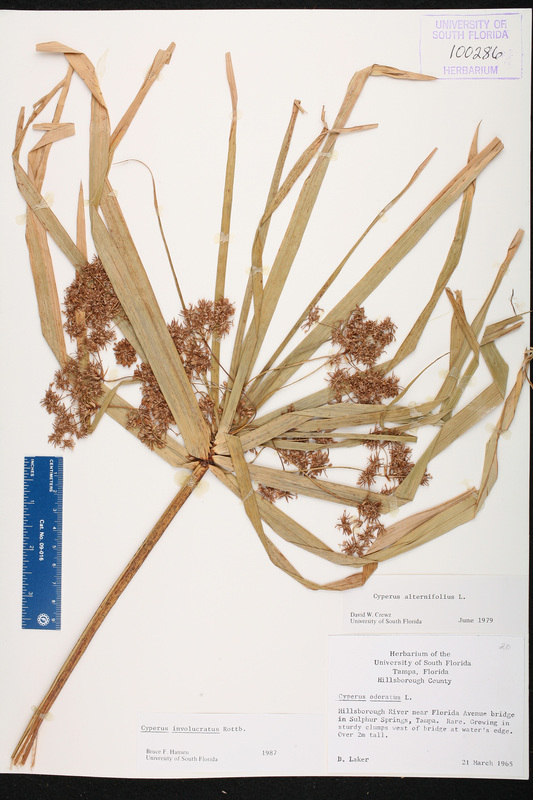 Cyperus alternifolius subsp. 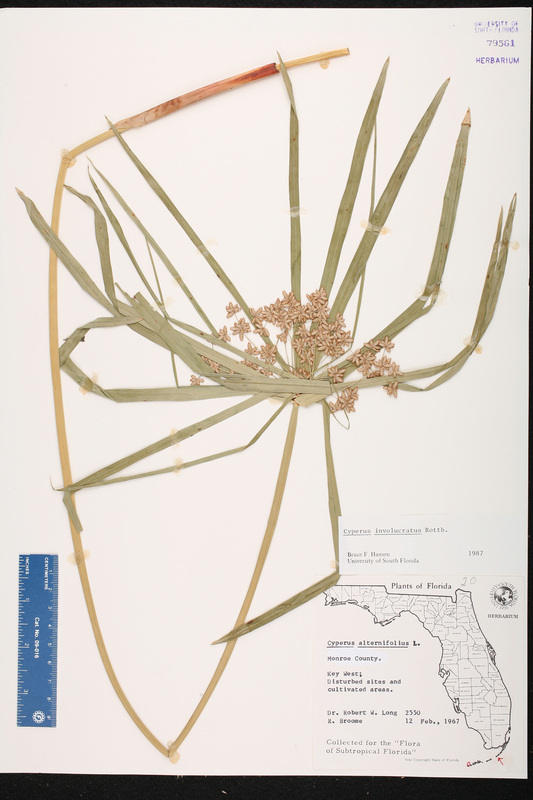 flabelliformis Cyperus alternifolius Linnaeus, subsp. 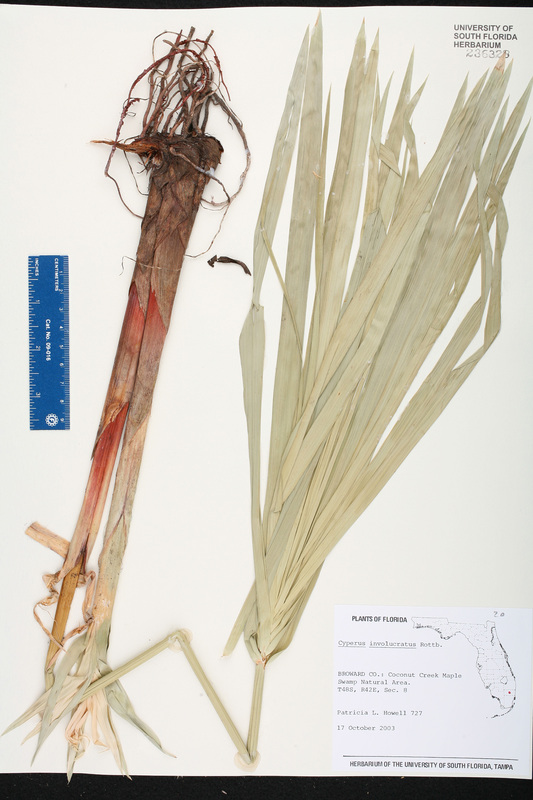 flabelliformis Kükenthal, in Engler, Pflanzenr. 4(Heft 101): 193. 1936. 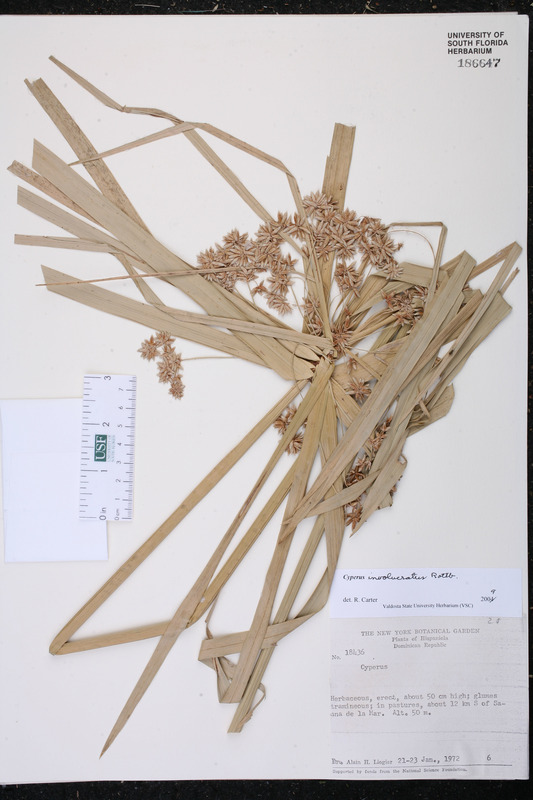 BASIONYM: Cyperus flabelliformis Rottboell 1773, nom. illegit. 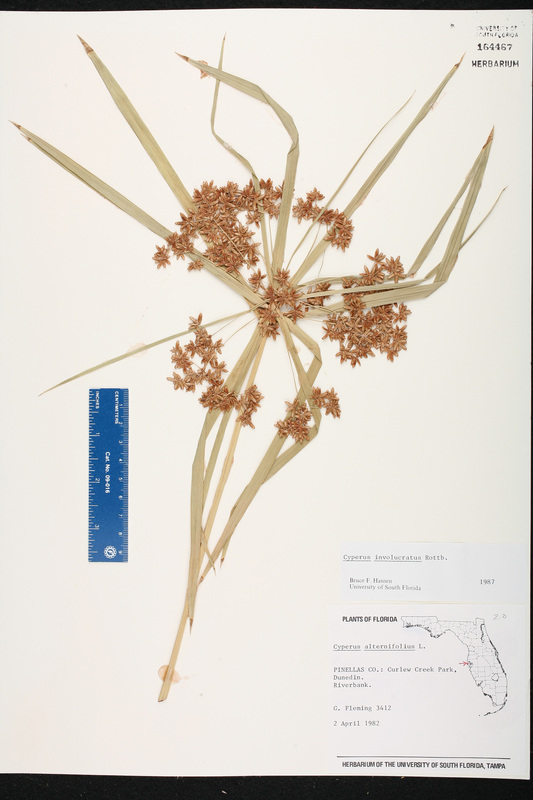 ; Cyperus involucratus Rottboell 1772. 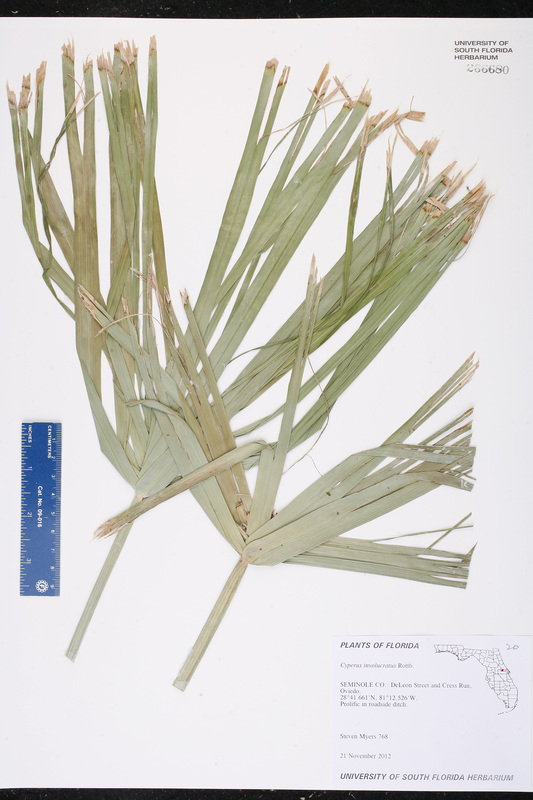 Cyperus alternifolus var. 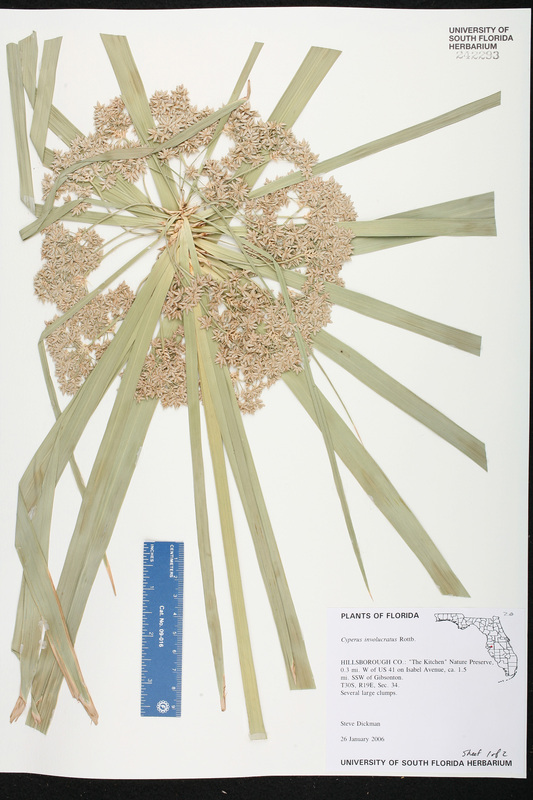 flabelliformis Cyperus alternifolius Linnaeus, var. flabelliformis (Kükenthal) M. R. Almeida, Fl. Maharashtra 5B: 304. 2009. 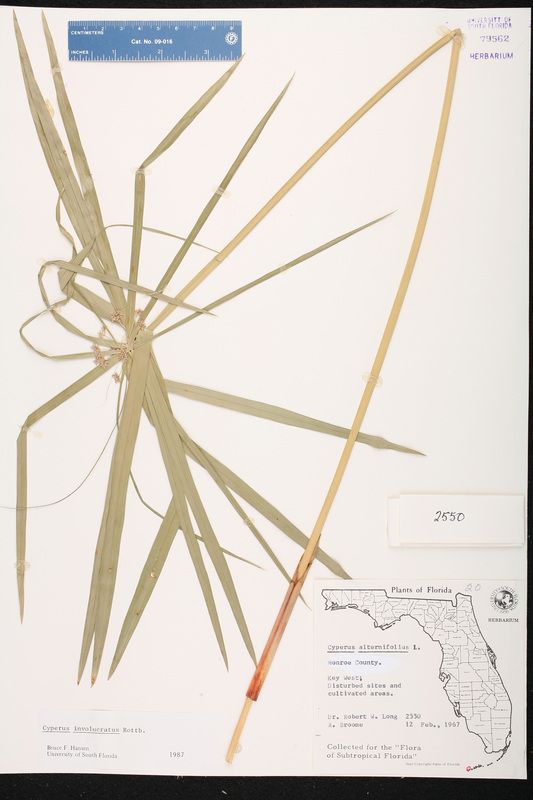 BASIONYM: Cyperus alternifolius Linnaeus, subsp. 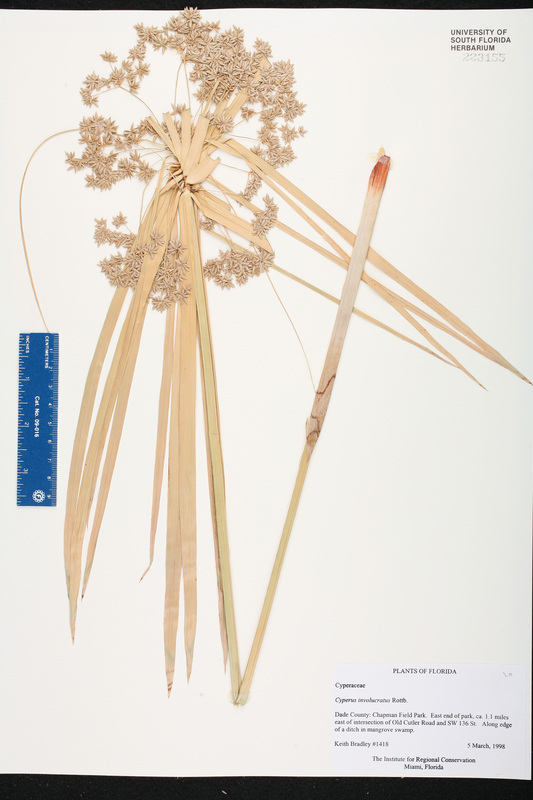 flabelliformis Kükenthal 1936; Cyperus flabelliformis Rottbøll 1773, nom. illegit. 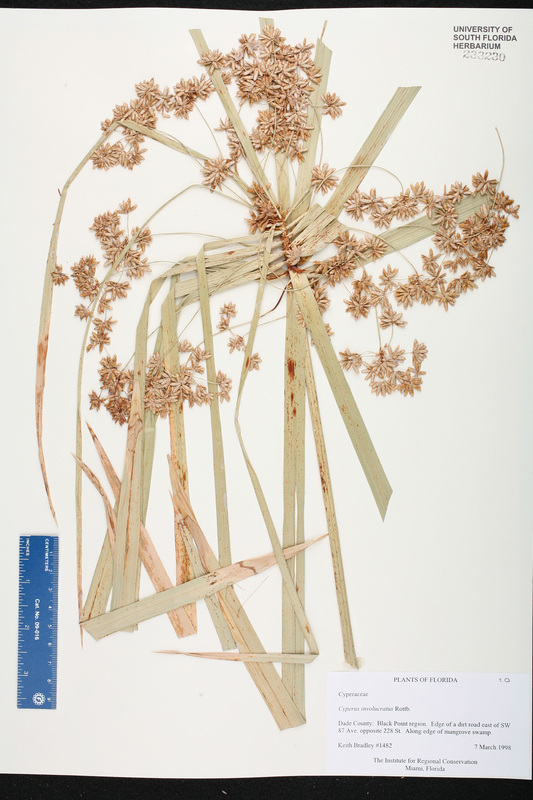 ; Cyperus involucratus Rottbøll 1772. 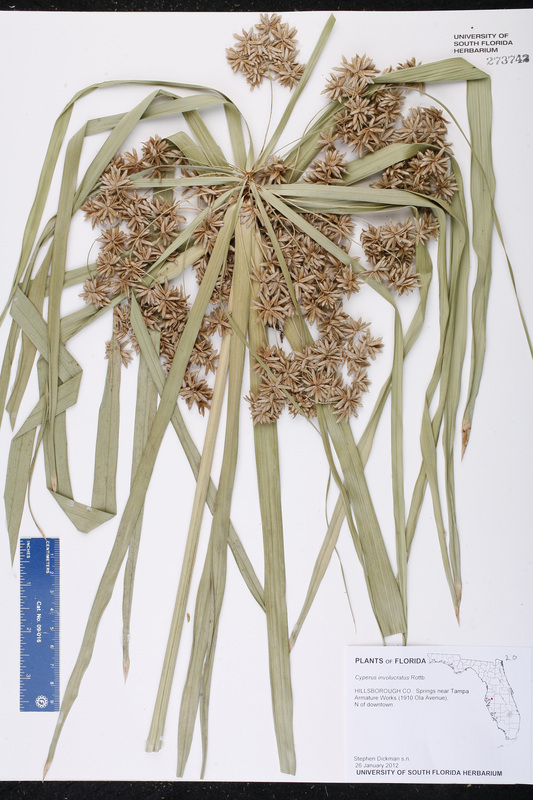 Cyperus flabelliformis Cyperus flabelliformis Rottbøll, Descr. Icon. Rar. Pl. 42. 1773, nom. illegit. 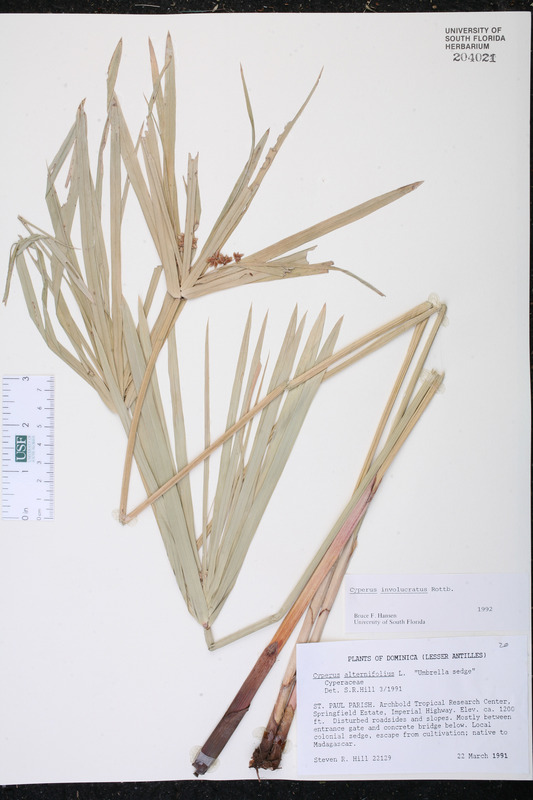 BASIONYM: Cyperus involucratus Rottbøll 1772. 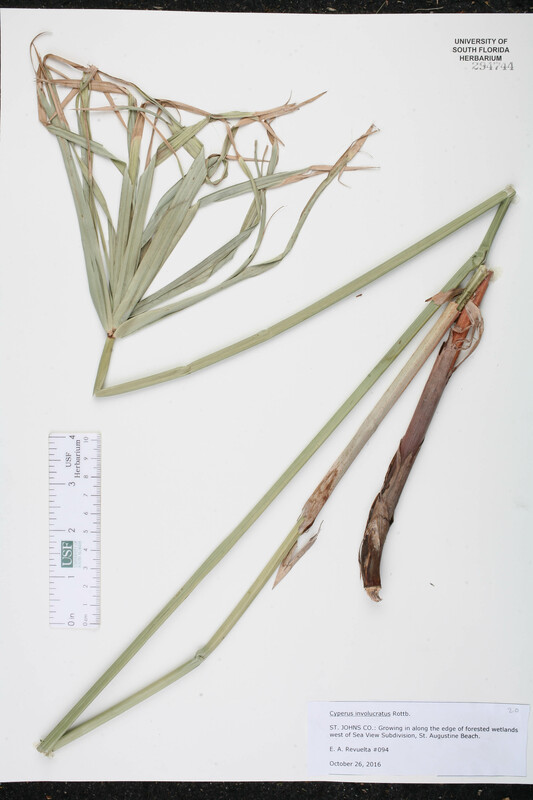 Cyperus alternifolius var. 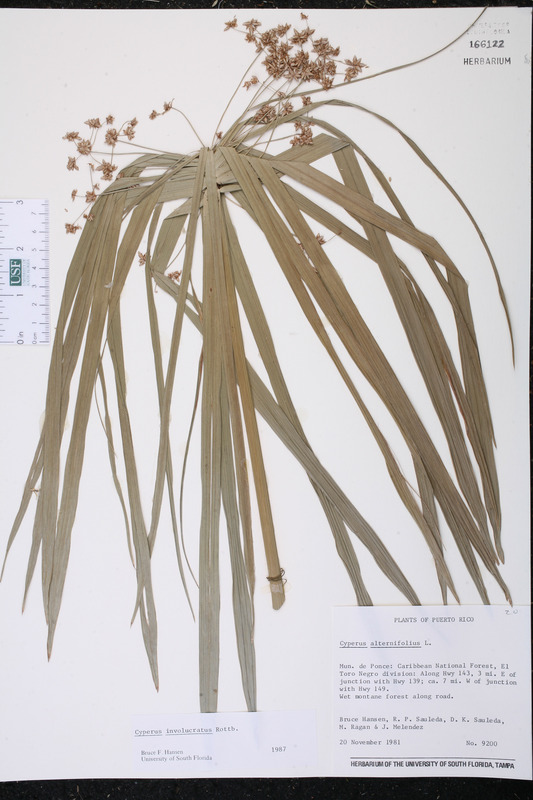 albovariegatus Cyperus alternifolius Linnaeus, var. albovariegatus Van Houtte, J. Gén. Hort. 14: 233. 1861. 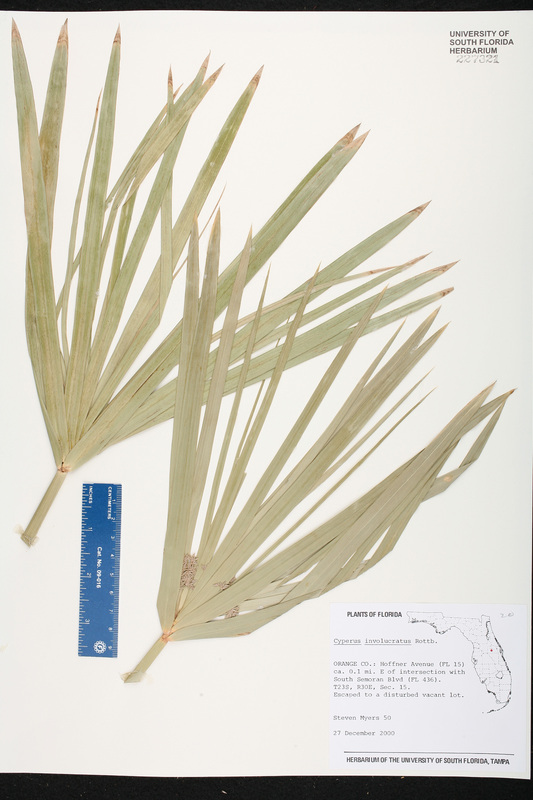 Cyperus alternifolius var. 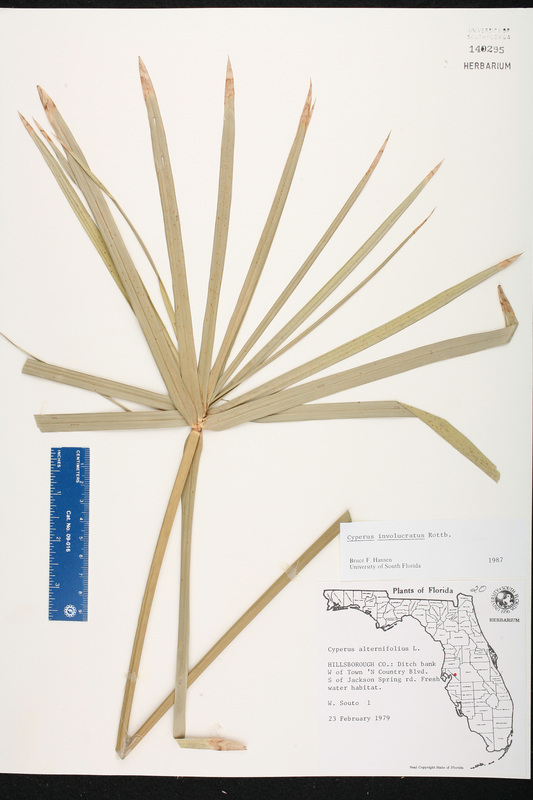 obtusangulus Cyperus alternifolius Linnaeus, var. 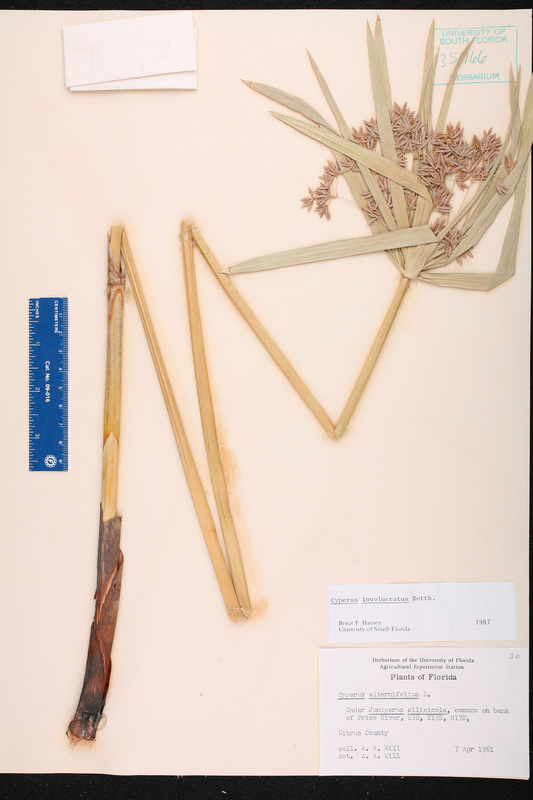 obtusangulus (Boeckeler) T. Koyama, J. Fac. Sci. Univ. Tokyo, Sect. 3, Bot. 8: 120. 1961. 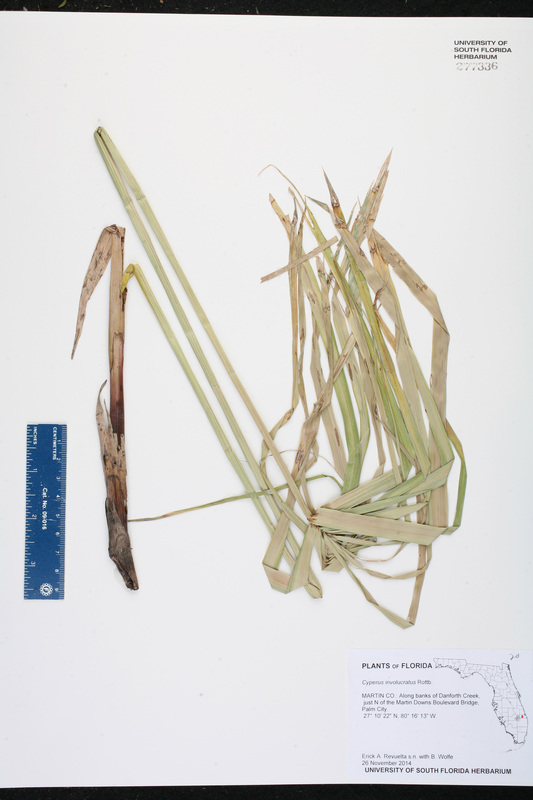 BASIONYM: Cyperus flabelliformis Rottboell, var. 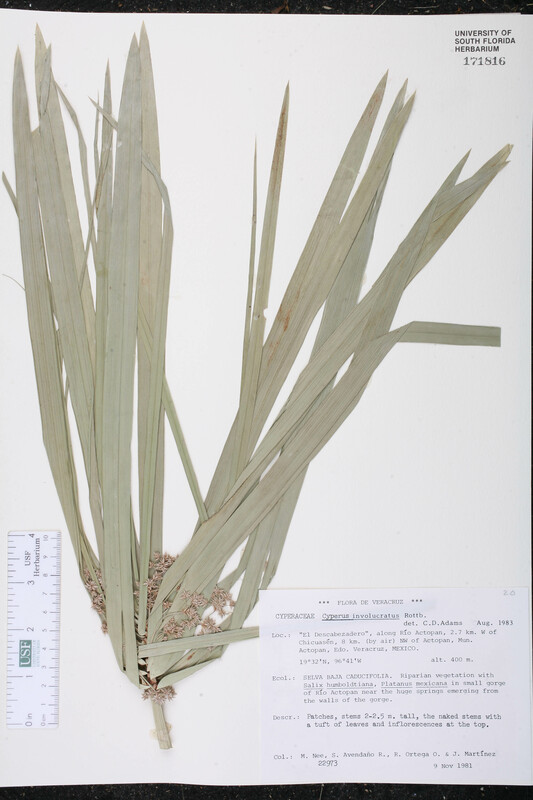 obtusangulus Boeckeler 1868..
Cyperus alternifolius var. 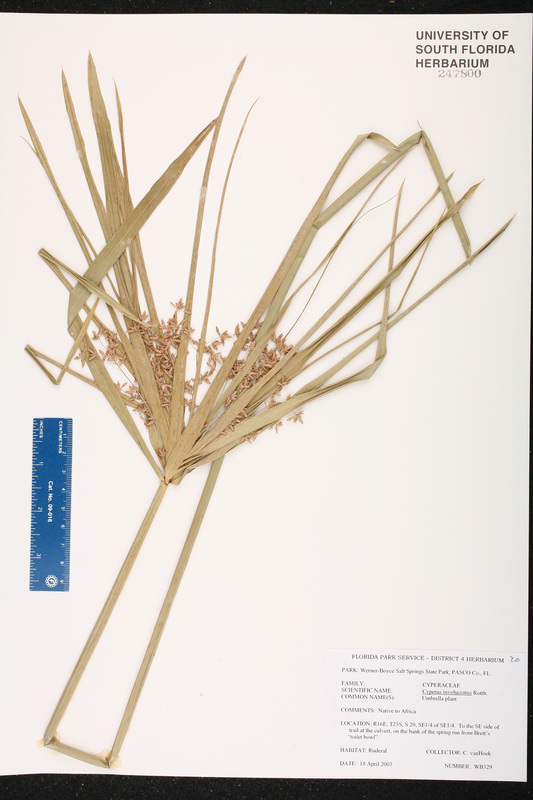 petersianus Cyperus alternifolius Linnaeus, var. petersianus (Boeckeler) Kükenthal, in Engler, Pflanzenr. 4(Heft 101): 194. 1936. 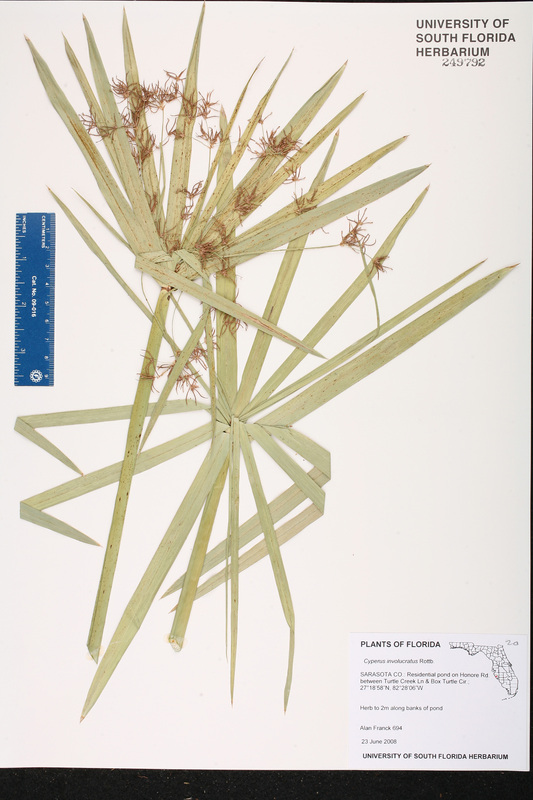 BASIONYM: Cyperus petersianus Boeckeler 1864. 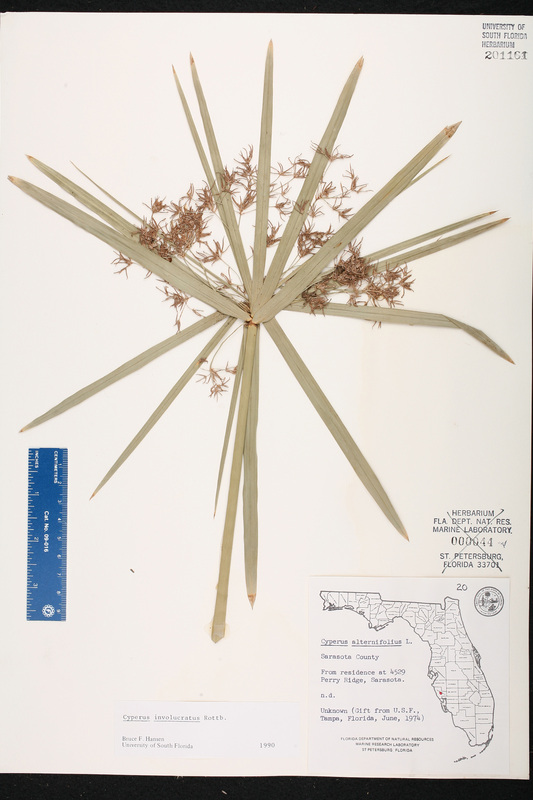 Cyperus alternifolius var. 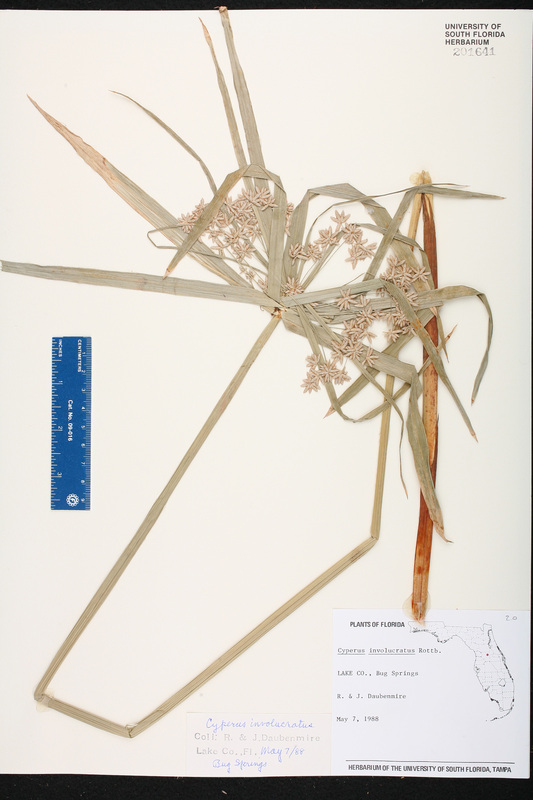 variegatus Cyperus alternifolius Linnaeus, var. variegatus Hovey, Nursery Cat. (Hovey & Co.) 1882: 27. 1882. 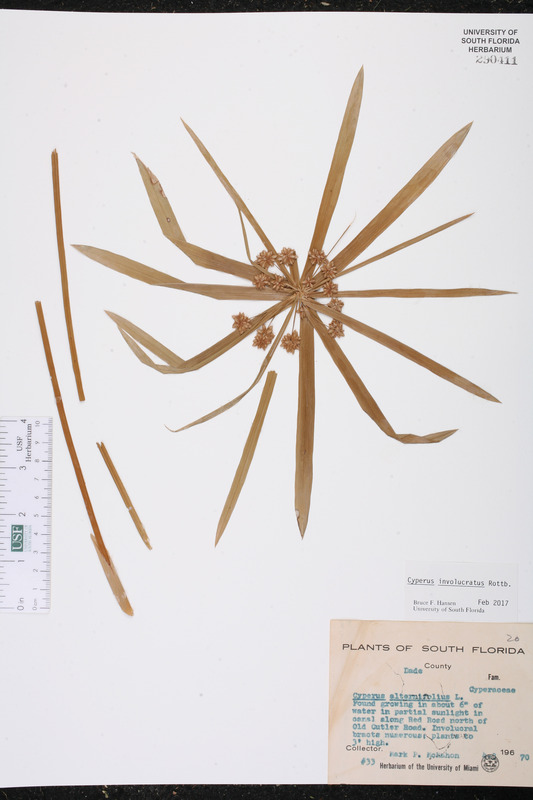 Cyperus gradatus Cyperus gradatus Forsskål, Fl. Aegypt.-Arab. 13. 1775. USA Florida Lake Co. 07 May 1988 R. F. Daubenmire s.n. USA Florida Sarasota Co. s.d. unknown s.n. USA Florida Hillsborough Co. 26 Jan 2006 S. Dickman s.n. Sheet 2 of 2. USA Florida Hillsborough Co. 26 Jan 2006 S. Dickman s.n. Sheet 1 of 2. USA Florida Citrus Co. 07 Apr 1961 A.A. Will s.n. USA Florida Hillsborough Co. 26 Jan 2012 S. Dickman s.n. 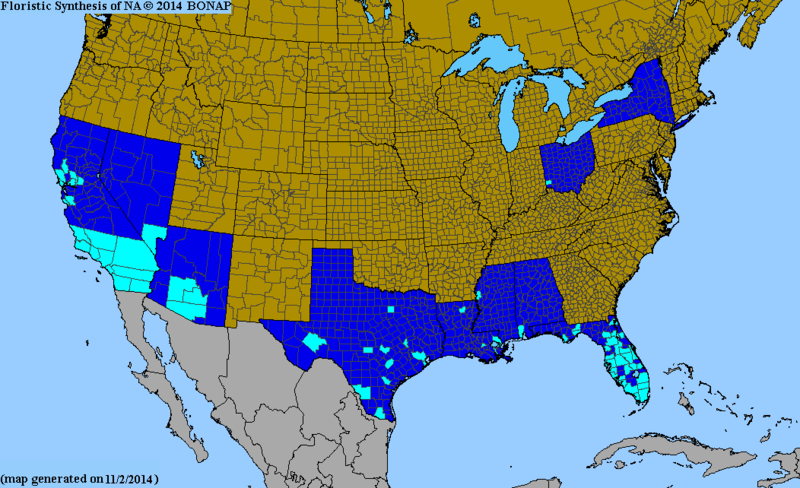 USA Florida Martin Co. 26 Nov 2014 E. A. Revuelta s.n. Dominica St. Paul Par. 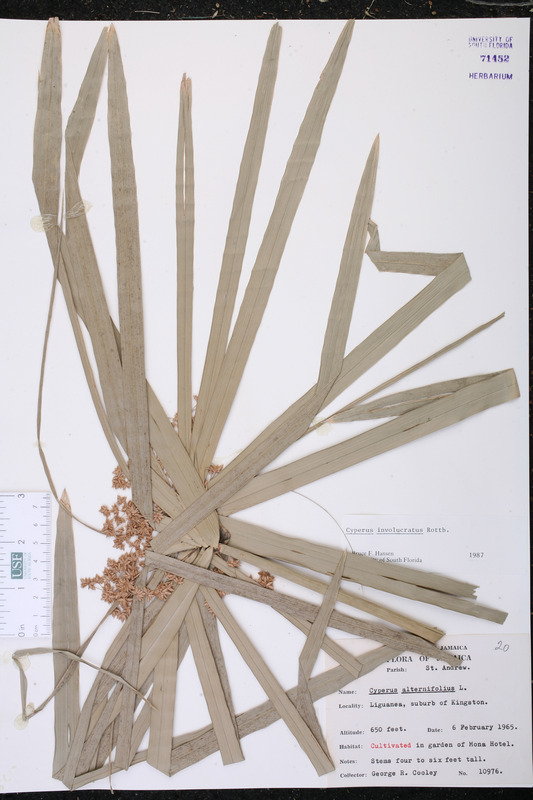 22 Mar 1991 S. R. Hill 22129 Escape from cultivation; native to Madagascar. Jamaica Surrey Co. St. Andrew Par. 06 Feb 1965 G. R. Cooley 10976 CULTIVATED.